Why Raise Ducks on Pasture? Pasture-raised ducks are happier and healthier than ducks raised in confined conditions. Raising poultry on pasture allows them fresh air, green space to forage for food, and room to exercise and stay fit. Ducks raised on pasture may forage for up to 30% of their food, saving money and providing tastier, more nutrient dense eggs and meat. Pasture-raised livestock animals have fewer problems with physical disease and emotional distress than those raised in confinement. 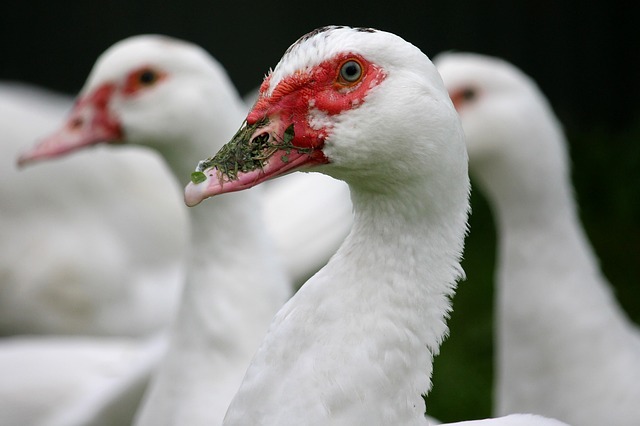 Muscovy ducks are prized for their dark, flavorful meat and ability to raise their own young. Raising ducks for eggs and meat is a great way to help supply your family with quality, nutrient dense meals. Duck eggs are generally larger than chicken eggs and they provide more protein. They’re also great for making egg noodles and baked goods. Cakes, quick breads, and muffins made with duck eggs are fluffier and more moist and rich in flavor! Duck meat is dark and flavorful. Many people prefer it to chicken. Raising ducks for meat allows you to hatch your own ducklings in an incubator each year and dress them at just 8 weeks. This time line rivals the Cornish x Rock broiler chicks that must be purchased from a hatchery. For those who wish to increase their sustainability and self reliance this is an important point. Ducklings are hard to resist! Ducklings need the same basic care as chicks for the first few weeks. They must be kept in a warm brooder and protected from predators and inclement weather until they are old enough to go out on pasture. For the first few days, it is a great idea to use Sav-a-Chick probiotics and electrolytes in their water. This helps them get off to a healthy start. It is very tempting to provide a little swimming ‘pond’ for ducklings. However, they may become chilled or drown because the oil gland at the base of the tail isn’t developed and their down isn’t waterproof. 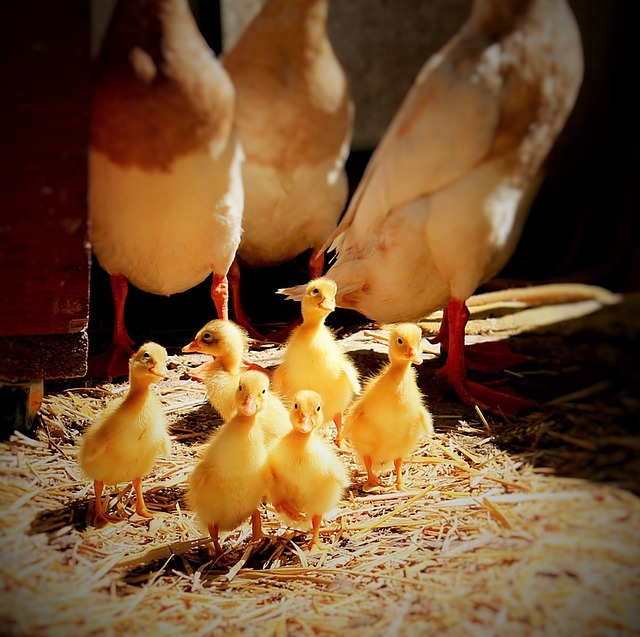 Keep ducklings in a warm brooder that is clean and free of moldy feed, wet bedding, and excessive manure. They mess up their brooder very quickly and it needs to be cleaned often. It may be necessary to place water containers over a grate that allows water to drain away but is not difficult for them to walk on. 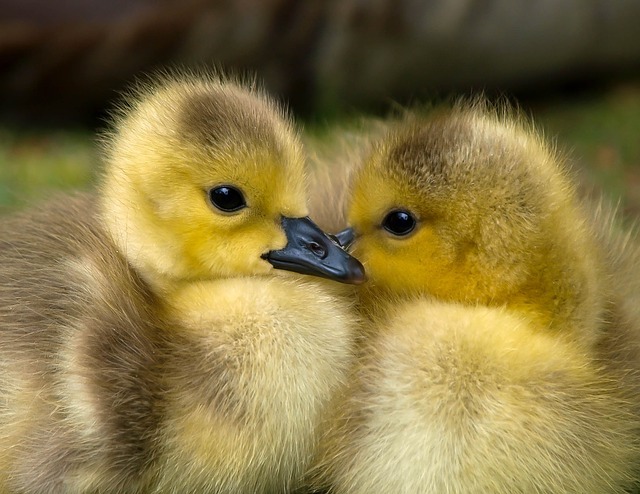 Ducklings and other waterfowl need more niacin than chicks because their bodies don’t process it as well. Niacin breaks down quickly in storage, so purchase fresh feed and watch for signs of niacin deficiency. Symptoms include difficulty walking, bowed legs, and inactivity. 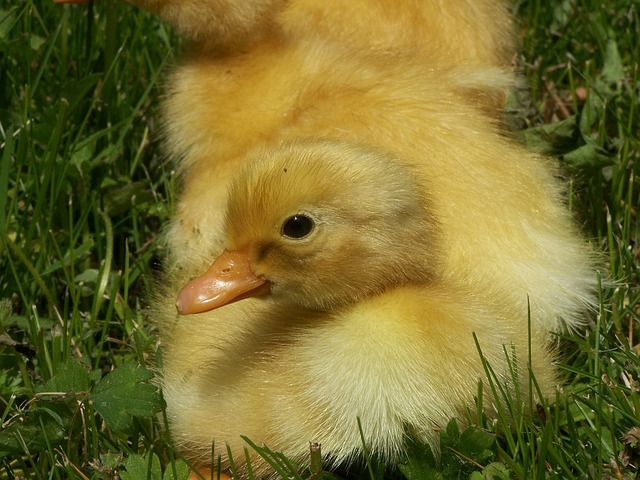 Many sources recommend feeding 20 – 22% protein feed until ducklings reach butcher weight at about 8 or 9 weeks of age. When raising ducks specifically for meat, this ration should be fine. However, if you are raising ducks for eggs or pets, start off with an 18 – 20% protein feed and switch to 16% at 2 weeks of age to prevent angel wing. This deformity is caused by abnormally fast bone growth from high protein feed. This Mallard duck is enjoying the pastured life. 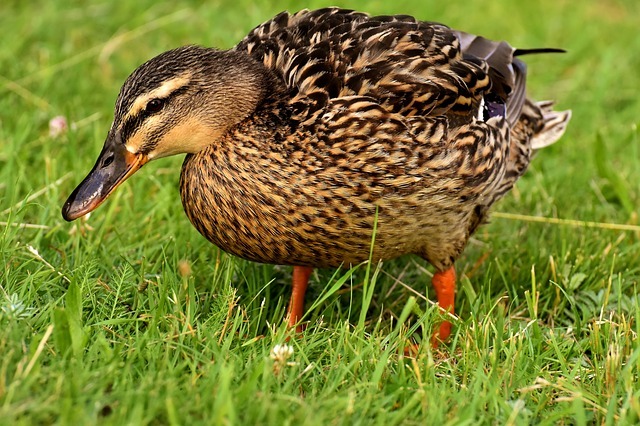 Allowing your ducks out on pasture gives them the opportunity to forage for weeds, grass, and insects. They may find enough food on good pasture to reduce their feed consumption by almost one third! This saves a lot of money and increases your sustainability on the homestead. For best results, mow their pasture to about 6 to 10 inches tall. Another method for pasturing ducks is to keep them in a ‘duck tractor’ similar to the chicken tractors gaining in popularity. This will help prevent predation and allow you to move the ducks in a more methodical manner to graze on fresh pasture. 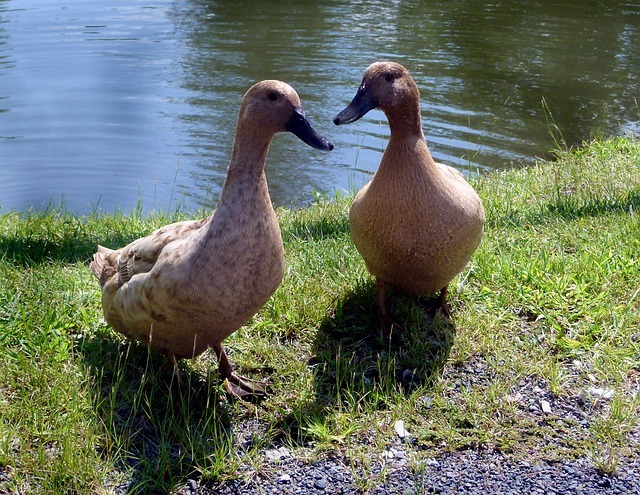 If your ducks will be in an open pasture, you may need to provide protection from predators. Donkeys and geese are both good livestock gaurdians, as well as some breeds of dogs. Geese will not be able to stop attacks from coyotes, wolves, bobcats and other large predators.If you are unable to keep a livestock gaurdian animal, make sure that your fencing is as predator proof as possible. Electric fencing may be necessary to keep out racoons and opossums. Ducks enjoy many vegetables from the garden and will happily devour unmarketable produce. Feed no more than one-quarter of their diet in treats such as damaged tomatoes, cucumbers, lettuce, Swiss chard, spinach, fruits, or other produce. Scratch grain may also be fed in small amounts, but be sure that their main source of nutrition is a balanced feed. If you can’t raise your ducks on pasture, try sprouting wheat grass fodder for them! A pond isn’t necessary, but these Pekins ducks are really enjoying theirs! What About Water or a Pond? Ducks don’t necessarily need a pond to be healthy, but they are much happier with one! At the very least, your ducks need a pan of water that is large enough to dunk their entire head under the water. This allows them to keep their eyes and nostrils clean. Without a clean source of water to dunk their heads, their nostrils may become clogged and they are susceptible to eye infections. It is best to provide your ducks with a kiddie pool or swimming pond that is large enough to get into and bathe. Ducks rub their bill over the oil gland located at the base of the tail to preen their feathers and waterproof them. 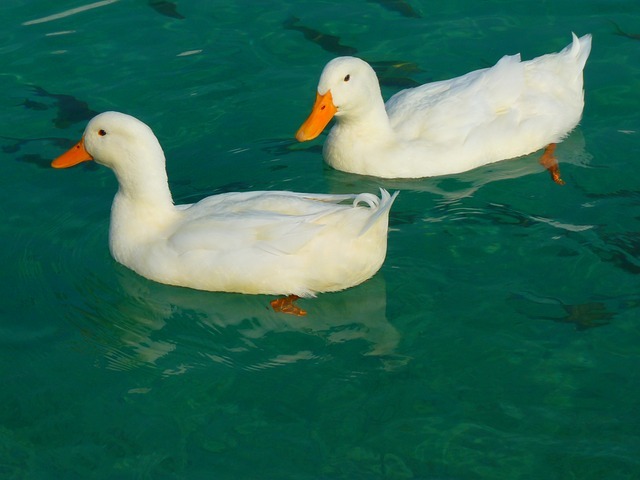 Without a pool large enough for bathing, ducks may not be able to clean and preen properly. This can lead to generally unthrifty ducks. If they will be processed for meat at 8 weeks, you may not need to worry about this. But they will be happier with a small pool. Most duck eggs are white, but some have a slight tint of green. Duck eggs are highly prized in many areas and may be profitable to raise and sell. If there is a thriving market for Asian foods, specialty farm products, gourmet foods, or local foods you may do quite well with a duck egg business. Check into the market, competition, and regulations before you begin this project. Khaki Campbell ducks are one of the best laying breeds. If you wish to raise just enough for your own use, it’s advisable to try duck eggs first to see if you like them. Some people prefer duck eggs only for baking due to the flavor. 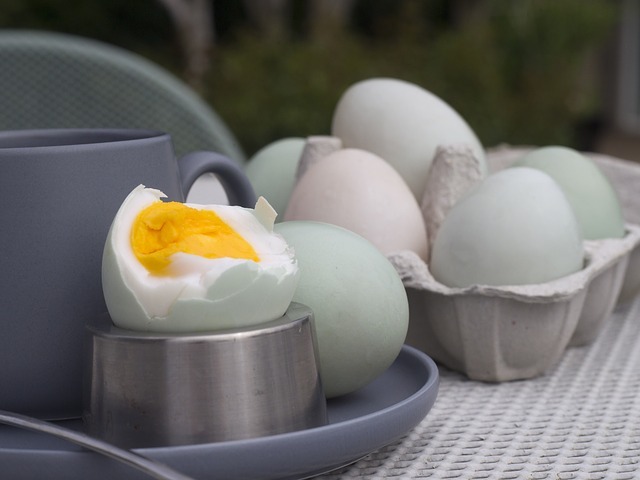 Duck eggs may be washed, coated with food grade mineral oil, refrigerated, and stored for up to 6 months for home use. Breeds that make great laying ducks include Khaki Campbells, Indian Runners, and some hybrid layers available from hatcheries. Pekin ducks also lay a respectable number of very large eggs in their first year. Raising ducks for meat is a good way to provide your own sustainable source of meat. Dressed ducklings are in high demand at specialty markets and gourmet food providers from September through December for the holiday season. 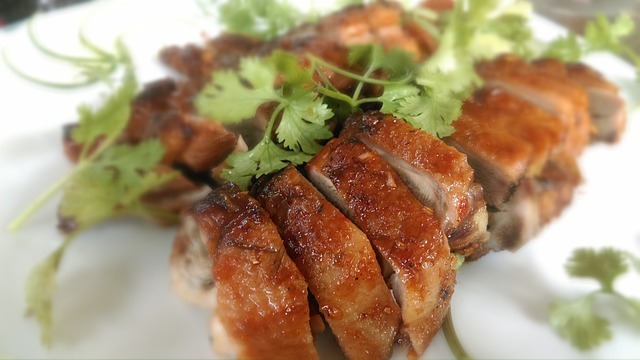 Local food markets and upscale restaurants also like to offer ‘wild duck’ during this period. If you are able to time finishing at 8 to 9 weeks for this desirable market, you may make a nice profit raising meat ducklings. To raise ducks for your own table, you won’t need to be nearly as concerned about the timing. However, it is best to hatch, brood, and raise ducklings during the late summer when they won’t need as much supplemental heat. Dressing ducks at home is better during the cool fall months. Another concern with home processing is the removal of down. For best results, use a duck wax from a hunting supply store or order online. The wax is melted and spread on the down. Once it hardens, peel away from the skin and the down will come with it. This reduces the time and mess of processing ducks. For complete instructions on processing ducks, check out How to Butcher a Duck on The Self Sufficient HomeAcre. Some of the best breeds of ducks for meat are Pekin, Muscovy, Silver Appleyard, Aylesbury, and Rouen. Pekins are noted for their large size, quick maturity, and white skin. Muscovies are especially prized for the flavor of their meat. Ducklings may go outside with supervision on warm days. There Are Many Reasons to Raise Your Ducks on Pasture! Pasture raised ducks are a great addition to your homestead. Whether you really just want them for pets or you wish to raise them for a nutritious source of eggs and meat, pastured ducks are happier. You will notice a difference in the flavor and color of the egg yolks. The meat will be leaner and more flavorful too! If we choose to raise animals as a source of food, then we should do our best to provide them with the most natural life possible and the way to do this is with a nice green pasture and plenty of sunshine and fresh air! I’ve been thinking of running geese this year for meat, but I hadn’t thought of ducks! I like their temperaments better, that’s for sure. Hmm…I’ll have to keep pondering – thank you for giving me something to think about! I do like geese too, Tessa. But I think they take longer to reach processing weight and they can be aggressive! Thanks for stopping by! Thanks for all this information. I will be keeping this handy for when I can have ducks. Thanks for all the information that is easy to follow. Happy to share, Jennifer! Hope you are able to get your own homestead and animals soon!